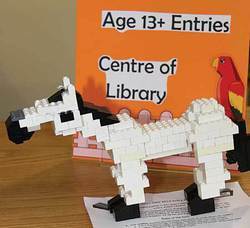 The third annual LEGO Gala at the Leduc Public Library went "very smoothly" said organizer Emily Richard, who is also the Youth Programming Coordinator at the library. "We had almost 70 entries in four categories and it was great to see the ideas and creativity the kids came up with in their displays." The four categories for entries were broken up according to age and were 0-5 years, 6-9 years, 10-12 years, and 13 and over. The numerous works of art were displayed in three different areas of the Civic Centre which included the Library, the Lede Room and the Atrium. Dozens of parents, siblings, grandparents and LEGO aficionados wandered from room to room checking out the hours of effort that had gone into all the entries. And for the kids who didn't have an entry into the contest they could still get their hands on some of those popular blocks and build an impromptu piece at the creationary table that was provided by the library. "The LEGO blocks we provided were actually part of a learning game," said Emily, "but the kids just wanted to have fun and build stuff and that was fine too!" she laughed. Other fun stations were set up around the Centre including a craft table, a colouring table, Pin The Head On LEGO Man, and free refreshments and cake were also available. The judges for the day included Mayor Greg Krischke, City Councillors Dana Smith and Glen Finstad, as well as two members from the Library Board. Emily readily admitted that it was "…very hard to pick the winners. They were all so unique and different!" Each age category received prizes for the top three entries with second and third place receiving gift bags, and the first place winner receiving a beautiful hard cover book all about LEGO. As their names were announced over a microphone in the Atrium thrilled youngsters with ear to ear smiles ran up to receive their prizes. And to make sure all the artists' were recognized for their hard work, each participant was given a loot bag filled with library pencils, stickers, and a "gold medal" to hang around their neck because really, each and every entry was a winner in their own right.